What is the generic name of Asthalin rotacaps? The generic name of Asthalin rotacaps is salbutamol. Asthalin rotacaps are globally manufactured by Cipla. It consists of salbutamol and is available at all the leading drugstore, online stores and medical supply stores. It is manufactured by Cipla which is its leading distributor globally. This drug is composed of salbutamol, and it should be noted that this drug is available in various dosages and strengths in the market. How The Asthalin Rotacaps 200mcg (salbutamol) works? Mechanism of action of Asthalin rotacaps is based on the fact that it relaxes our respiratory muscles and hence reduce difficulty in breathing. You are not suffering from thyroid gland disease. What should you avoid while using Asthalin Rotacaps 200mcg (salbutamol)? When should You Not Use Asthalin Rotacaps 200mcg (salbutamol) ? Asthalin rotacaps should not be used with alcohol or any severe pathology. If you are pregnant or breastfeeding recently. If the patient is suffering from any other illnesses, disorders, or medical conditions that may lead to complications. If the patient is on or using any other drugs or medication. If you have any vitamins or supplements. If you have an alcohol addiction and vision problems. You should tell the doctor about any thyroid gland conditions. How Much Asthalin Rotacaps 200mcg (salbutamol) should be taken? 200mcg of Asthalin rotacaps can be taken. Recommended Dosage:- 200mcg of Asthalin rotacaps is recommended and if the disease worsens consult with your physician. 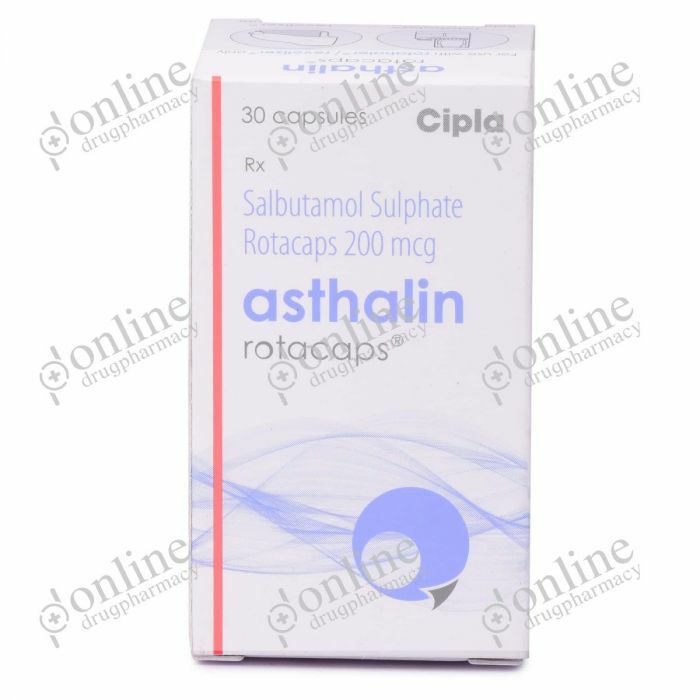 How To Use Asthalin Rotacaps 200mcg (salbutamol)? It can be taken by inhalation. For How Long Should You Continue Using Asthalin rotacaps? You should continue to use it as long as the directed by your physician. Sometimes the drug can be continued for lifetime. Excessive overdosing of Asthalin rotacaps needs immediate attention of doctors and can lead to Headache, Nausea, Vomiting, breathlessness, Sweating, drowsiness, loss of consciousness, restlessness etc. Missed dose of Asthalin rotacaps. If you miss a dose of Asthalin rotacaps, then next dose should be taken as soon as you remember, but it should be well spaced from the next dose. We should try not to take an extra dose at the time of the second dose as it will become a double dose and this can result in various side effects. So avoid the dose and go back to your regular schedule. Side Effects Of Asthalin rotacaps. Drugs that interact with Asthalin rotacaps. You are not suffering from thyroid gland disorder. Asthalin rotacaps are indicated for use in the treatment of asthma. These must be used as indicated your physician. Asthalin rotacaps are single unit dosage form 200mcg of Asthalin rotacaps can be taken. 200mcg of Asthalin rotacaps is recommended and if the disease worsens consult with your physician. It can be taken several doses like 50mcg to 200mcg etc. depending on the severity of the disease.